That’s the only safety precaution in the area. No guardrails. Just a sign. How many of us really need a sign, or a guardrail, to tell us to stay away from the edge? Can’t we see the danger on our own, without the sign? The truth is, probably not. Simple. The edge is where the action is. We know it’s dangerous. 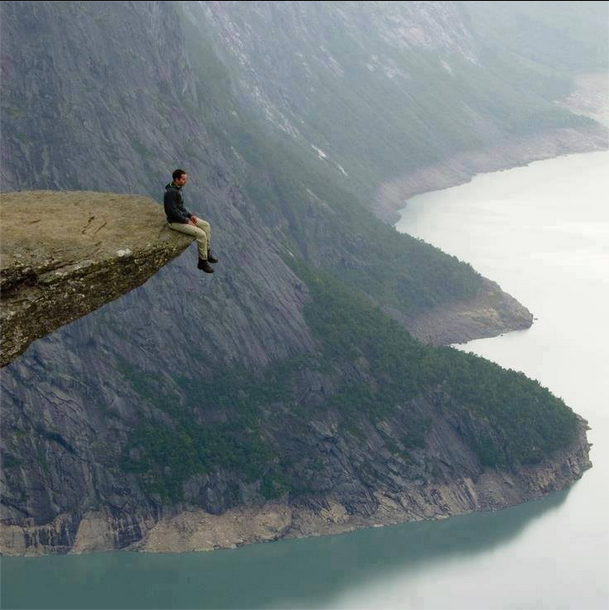 We know our mind will play an imaginary leap that only our subconscious sees when we look over the edge. We secretly like the butterflies we get in our stomach. The edge brings sharp focus. It’s where our imagination is most alive! Sometimes, the edge represents the end of a long journey. A challenging climb. Our view over the edge reminds us of the distance we’ve traveled. The work we’ve put in to get there. The edge is like the proverbial flame that draws the moth. The edge reminds us of how fragile our life is. One step away from real danger. How do we approach the edge, and take in its energy, while avoiding the danger that lurks just one step beyond? It’s a question we each have to answer for ourselves. But, here’s hoping we don’t discover the answer as we tumble over the edge. This entry was posted in Appreciation, Attention, Awesomeness, Balance, Fear, Freedom, Gratitude, Innovation, Leadership, Listening, Success, Surprises, Writing, Zombies and tagged Living on the Edge, Mt. Vesuvius, Pompeii on January 29, 2016 by Bob Dailey.